Blogging is an informal place to get into more details about things than a social media status; however, many bloggers have upped their game as professional writers. In many ways, a small business forms, and like any small business, the Holidays is an opportunity for some marketing (and possibly sales). When my father sold advertising, he said the busiest time of year in advertising sales was between Back to School and Christmas. From New Year's to May were his slowest months. Shopping, advertising, and commercialization all together has its biggest bang now, the moment before Christmas. 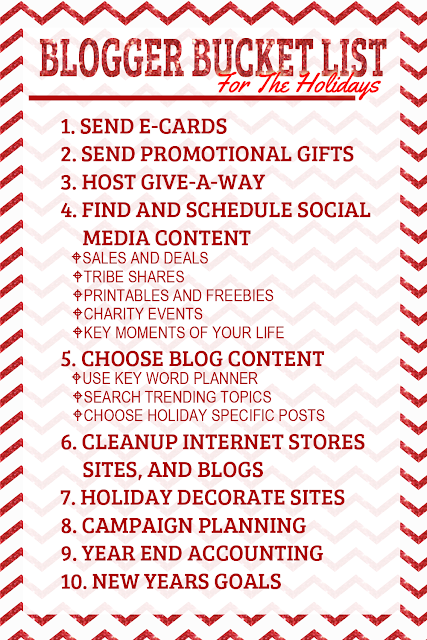 Here are some ideas for a Professional To Do or blogger bucket list of activities before Christmas. Send Holiday ecards and free samples of your work (or swag with your logo) to colleagues you work with, like bloggers, graphic artists, and publishing contacts. Focus on those who have helped you through the last year. Let them know you appreciate them. Also focus on a list of people you'd like to get to know better as a means to start building a rapport. Host a Give-A-Way as a present to your readership. 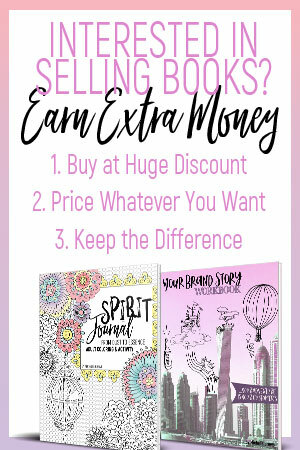 In my experience, the most successful give-a-ways I've seen for smaller businesses on the web entail a multi-blog give-a-way where 10 blogs put in a small share of the prize and all share the promotion to their audiences. Market your tribe. Anyone who is in your tribe probably has something special going on this Christmas. Jen Mann just published Spending the Holidays with People I Want to Punch in the Throat. Lisa Nolan published Mom for the Holidays. Choose a charity and promote donations. Even better, do something for that charity and blog about the experience. Take photographs. It's great PR, especially if you are running for office, but hearing stories of people helping people is a feel-good inspiration to others. Take photographs of your family traditions and activities. People love being reminded that you are human. Holiday related content for social media: Christmas memes, printables, Christmas related news and events... You may decide to schedule these if you can as the Holidays get busy and you may not sneak out to post that meme on Christmas Eve. Take an hour to play with Google's Keyword Planner and find some good keywords to focus on for Holiday posts. Most of my blog articles are about ideas that pop in my head and from there, I make my keywords; however, most SEO Content Strategy Companies choose keywords first and then have writers write for them. Mention the key word at least 3 times in content, once in a heading, 2 to 3 sentences in between their usage (use synonyms if you need to use it more often than that), and make sure that word is in the Title and URL address. You can also search for trending topics on various social media (i.e. Pinterest and Twitter), as well as trending searches in various stores (like Cafepress and Zazzle). If you sell anything, prepare for Holiday sales. Have your store front (website) looking good, decorate it for the Holidays, add some new products, and market any sales. Of course, this step should have started around August with October being your deadline for readiness, and November being your month to heavily advertise Black Friday events, but it's never too late. Whatever date you decide to start on this, jot down a quick marketing plan. What products in particular do you want to promote? On the final 3 days of "Get it Before Christmas," market that heavily. If you have any "internet-based" products like an e-book that can be used as a gift, "Last Second Gift Ideas" might be a great angle (with e-books, all you need is an email). Accounting. Year End is approaching. Unless you go by Fiscal, now is a good time to make sure your financial records are up to date. If you actually do accounting, prepare for closing entries. If not, just prepare your reports and have them ready for Tax Time. If you paid people to do any work, make sure you have a good record (and any receipts) for those payments. If you got paid by people, keep track of your revenue. With New Year's on the Horizon, resolution timing is a great time to re-evaluate your business and career and make some New Year's goals. Take a look at what you wish you did more of at this point, and write that down. Meanwhile, where do you want to be this time of year next year? Do you want a higher fan base on your social media? More emails? Maybe you want to be published more in other places on the internet, or write a novel. You may decide you want to reach a new target market and come up with ideas on how to do that, where to make new friends, and where to find the people who are most likely to enjoy your work. Whatever you do this Holiday Season, be sure to take time to enjoy it. Don't do any "giving" things as a task. If you don't enjoy it, that will show through. I know it's hard to force enjoyment on things, but do what you need to have fun with it. Get a friend to help. Get yourself cozy with your favorite drink and music. Time things for your best cognitive period of the day. Check out my Wine Drinking Playlist and my Christmas Playlist.